The real beginnings of sailing in canoes are lost in (pre)history. It seems likely that sailing craft with a point at each end existed thousands of years ago. 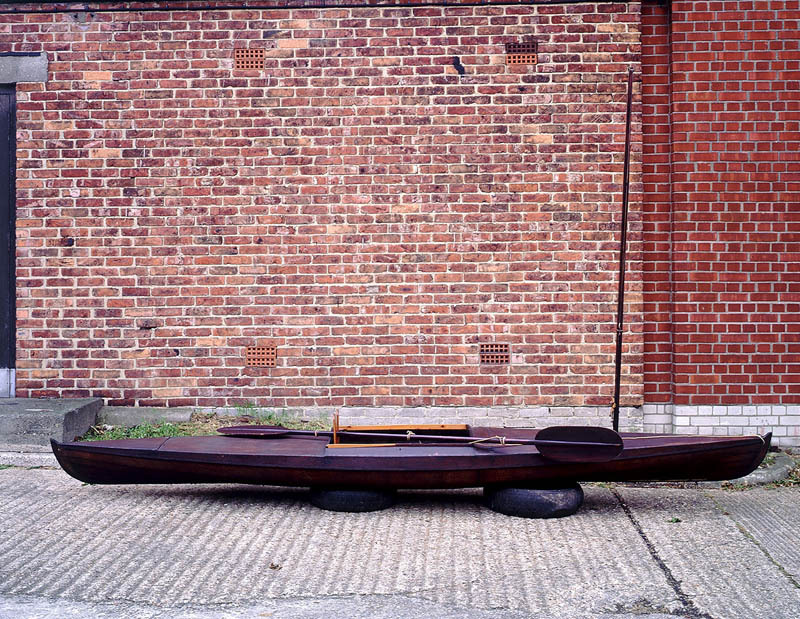 But in the mid 19th Century canoeing started to become an, if not common, at least not unusual leisure activity. Maybe it was part of the romantic view of North American Indians at the time... Once people had canoes it was, presumably, obvious enough to put sails on them. The lineal ancestors of the IC are the decked canoes of the 19thC. 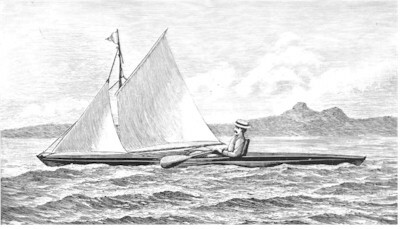 The patriarch of decked Canoe sailing was John MacGregor. 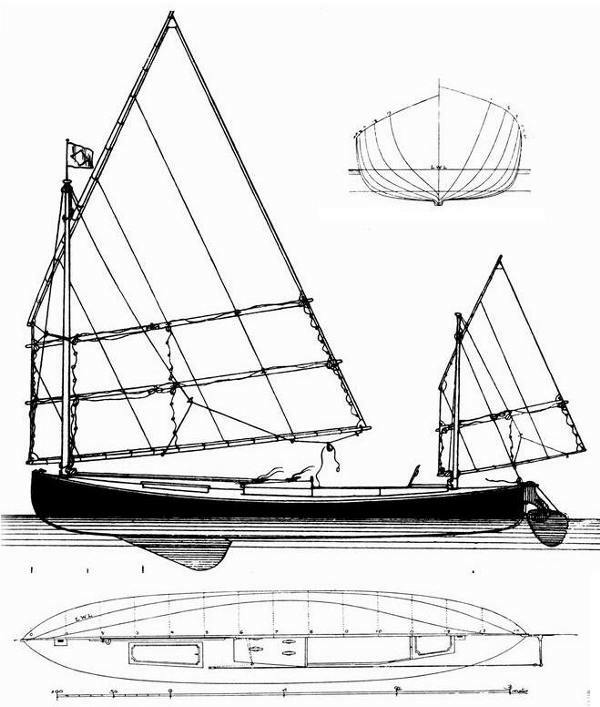 His 'Rob Roy Canoe' had a small sloop rig with a lug mainsail for use when the wind was favourable . He described his craft with these words: "The Rob Roy canoe was built of oak, with a deck of cedar. She was fifteen feet in length, twenty-eight inches broad, nine inches deep, and weighed eighty pounds. 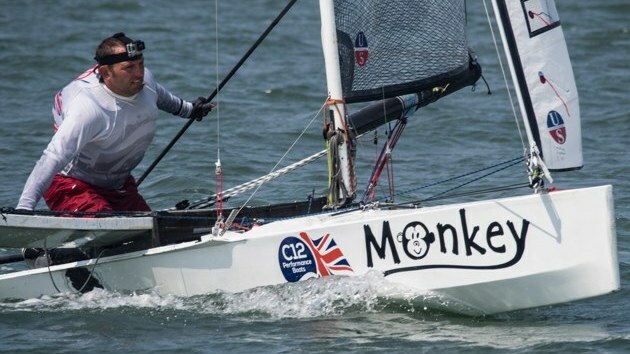 A paddle seven feet long with a blade at each end, and a small lug sail and jib, were the means of propulsion, and a pretty Union Jack was the only ornament. My baggage for three months was in a black bag, one foot square and six inches deep. The cockpit was three feet long and eighteen inches wide, and there were two bulkheads, six feet apart." The paddle was not only propulsion, but also the only means of steering! He took this craft on a sustained voyage of around a thousand miles of inland waterways and lakes in Europe, followed by other similar trips in similar craft. Even more importantly he wrote about his trips and sold thousands of books. Canoeing had arrived. MacGregor founded the Canoe Club in 1866, which became the Royal Canoe Club in 1874. Warrington Baden-Powell (brother of the Scout movement founder) was another prominent figure, as was EB Trewden. In 1874 the Club instituted an annual competition for the Paddling Challenge Cup and in 1875 the Sailing Challenge Cup. The Sailing Cup is a very impressive piece of Victorian silverware, and is still competed for at the UK championships. The Royal Canoe Club was (and is) based on the River Thames at Teddington, just upstream from Kingston bridge, but active Canoe clubs also sprang up on the Clyde (now Loch Lomond SC), the Mersey, the Humber and other locations. These clubs tended to develop their own styles of sailing canoe, and even used different rule sets. The UK canoes of this period were boats that you sat in, and didn't change position - rather like a 2.4m keelboat now. They normally had ketch or yawl rigs, with a sail - usually a lug sail - set on each mast and no jibs. Many of the boats appear from photographs to have battens or light spars in the sails, apparently a slab reefing arrangement, but in later photographs this battening is clearly supporting mainsail roach. The rudder was operated by the feet. Baden-Powell built a large number of boats named Nautilus which soon developed into fairly heavy craft with a foot controlled rudder and a substantial steel centreboard. By the 1890s a Nautilus style canoe might carry a 65lb centreboard, 70lbs of movable ballast (shifted to the windward side when tacking) and 190lbs of fixed ballast! Trewden had his own series of canoes, all named Pearl, which were flatter floored than the Nautilus style. Its worth noting that the end of the 19th Century was an age of dramatic technical innovation, and racing craft were built, sailed and then rendered obsolete at a frenetic pace. In many classes - even of much larger craft than the canoes - the competitive life of a boat might not even be as much as a season, and that in an era where boats took much longer to build and the clothing prohibited all year round sailing. The American Canoe Association was formed in the US in 1880, based at Lake George in New York State. In these early days this was every bit as much a cruising organisation as a racing one, and canoes would arrive at events with the owners tent, bed and camping equipment stowed on board. Canadian boats were soon coming over the border to join in these events. 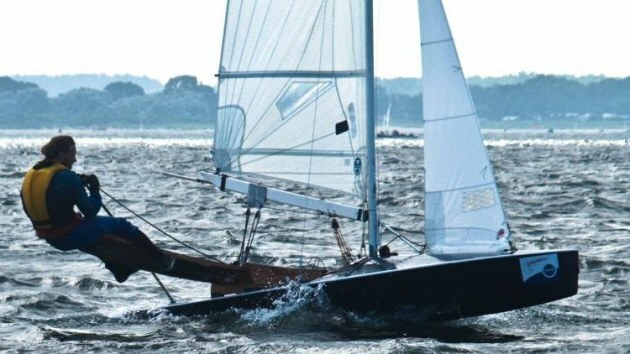 At first the US boats most resembled the Nautilus style and were intended to cruise to the venue and be capable of winning paddling as well as sailing races. 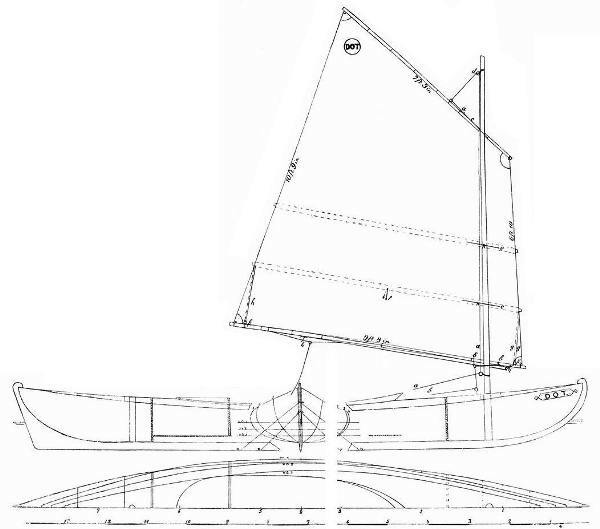 From the late 1880s pure racing sailcraft started to be built with multiple rigs, lower freeboard, smaller cockpits and the like which couldn't practically be used for the cruising expeditions. to have been sailed with a tiller whilst seated on the deck. The next big step was by Paul Butler, who introduced the sliding seat. With the extra power, no need for the ballast, and, I imagine, also because they were tending to sail on lakes as much as the sea, the US boats became much lighter and finer. They also acquired more sail area. Butler also introduced self-draining cockpits and clutch cleats for the sheets - these seem to have been a sort of early cam cleat with a lever to lock and release rather than being spring loaded. 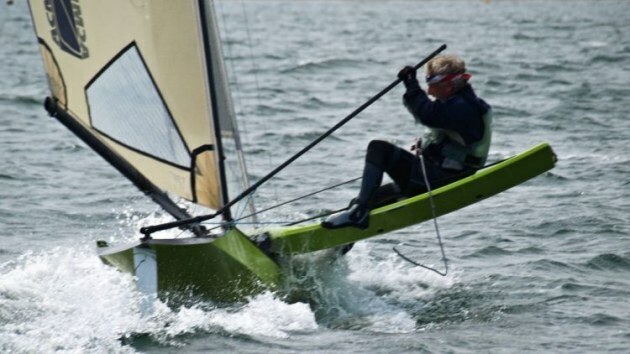 Through to the end of the century the US boats became lighter with finer lines and lowered freeboard - pure racing machines. 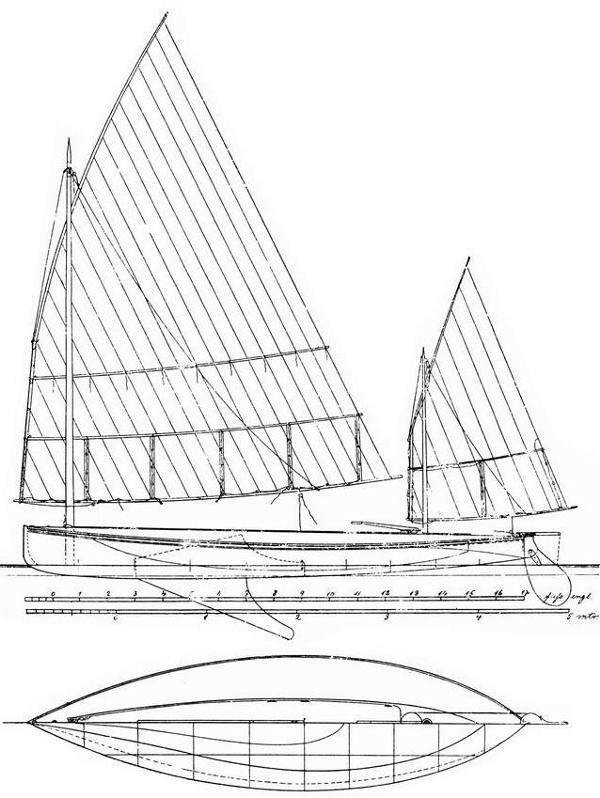 The dimensions of the US boats consolidated towards a box with maximum dimensions of 16' * 30", which, together with the two masted rig persisted for many years. Indeed a very few boats of this rig and dimensions are still built and sailed in the US. had more rise of floor than the drawing shows. International competition began in 1886 with a challenge, led by Baden-Powell. The trophy was the New York Canoe Club International Cup, which is the oldest international trophy still competed for small sailing craft and probably the second oldest of all after the America's Cup. 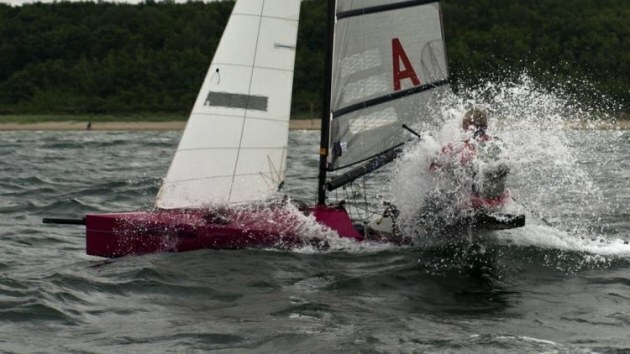 The rules required that the races be held in the home waters of the Holder and subject to a challenge on behalf of a club representing a foreign country. The Baden Powell competed with his latest Nautilus and Walter Stewart with a Pearl design, both heavily ballasted and sailed from inside the boat in the traditional way. 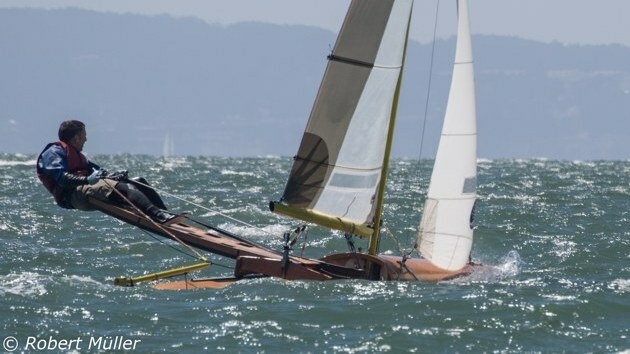 They lost: decisively: the light boats with the plank were simply in another league. Stewart challenged again in 1888, with a new boat but lost again. The next few challenges, up until the Great War, were all by Canadian sailors, and the US successfully defended on each occasion. 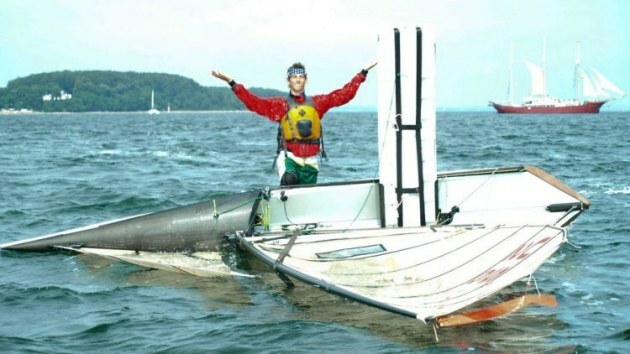 The Canadian craft look to have been of a similar style to the US boats: hardly suprising as the main focus of Canoe sailing in the US was New York State. There was a problem with these highly sophisticated racing machines in their different styles each side of the Atlantic. They just weren't popular compared to the cruising boats of twenty years before, and the classes were having great trouble maintaining what we would now call critical mass. They were so sophisticated and so difficult to sail that the average sailor didn't want them, and towards the end of the century things were looking a little tricky. "Snake" had sailed the fourth round in 9min 51 sec. This race is worthy of further comment, it is the fastest of which there is any official record. The "Snake" sailed the full 6 mile course in 1:05:07, half the distance being close hauled. The course somewhat resembles the letter Z and the water is very shallow most of the distance. The buoys too were rounded twelve times, and yet the "Snake" and the "Torpedo" attained an everage of nearly six miles an hour over this very difficult course. Thus we conclude that if they sailed half the distance when close hauled at, say, four miles an hour, they must have sailed half the distance, too, in one-third the time, or at the rate of 9 mile per hour. That the "Snake" attained an extraordinary pace when running with a quarterly wind there can be no doubt, but it was in the three or four strong puffs during the race that she left the "Torpedo", which is 2ft longer than "Snake", a long way astern. It was evident that this boat ha the extraordinary power of rushing over the water at ten or twelve miles an hour, probably more, without any wave-making apparently; only a wide smooth wake is seen astern. Yet at five or six miles an hour she makes waves like any other boat.". So without a shadow of doubt what we have here is a description, perhaps the first, of a planing sailboat, some thirty years before Uffa Fox and Avenger. Theo Smith of Oxford had indeed created something quite new! Snake - perhaps the first recorded planing sailboat. From about the 1890s sloop rigs started to appear in the UK, mostly gunter rigs with quite high peaks. 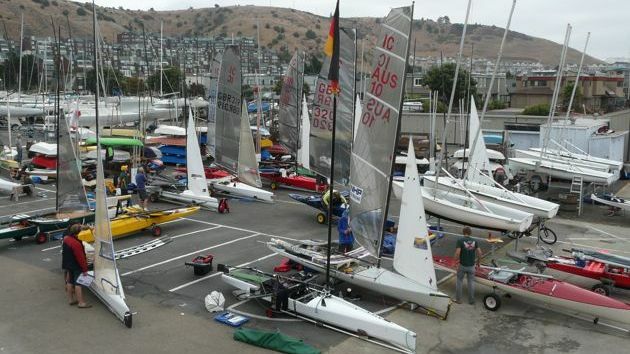 The "traditional" ketch/yawl rigs continued, some with lug sails and some with gunter rigs, but in decreasing numbers. At this distance the history of the decked sailing canoes in the UK at the end of the 19thC and the beginning of the 20th starts to look very confusing. 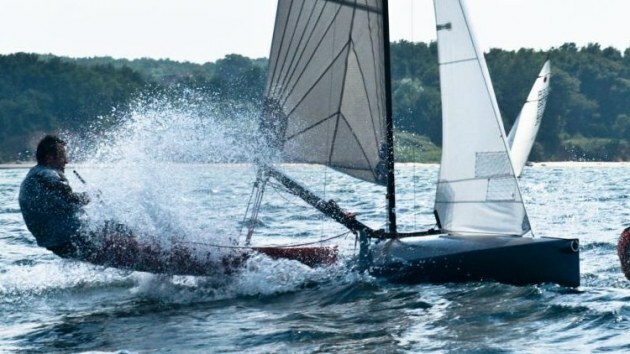 There was, probably unachievably, a desire to keep the concept of the dual purpose cruising and racing canoe alive, and it seems as if every few years there was a new initiative, class or division to encourage this to happen. Its all documented in Andrew Eastwood's work, referenced below, but its too complex to do more than skim over it here. It also tended to be very local - what was happening on the Thames was different to the Clyde and Humber for instance. The most important division - on the Thames at least - was probably between what were called racing and cruiser class canoes. The cruiser canoes don't seem to have been true cruising boats like those of twenty years before, but just a little less extreme than the pure racing craft. The rule gave maximum dimensions of 16' (later 17') * 42", so this was a significantly wider and stabler boat than its US contemporary. The cruiser class was later called/developed into the B Class, and was to be the most popular type in the Thames region for the next few years. For the next few years central figures at the Royal Canoe Club included Linton Hope and Bertram de Quincey. Major Linton Hope was surely the predominant dinghy designer of his time: responsible, amongst much else, for many Thames Raters and much early development in what was to become the International 14 Class. He was even involved in the design of seaplanes and was consulting Naval Architect to the Air Ministry during and after the First World War. 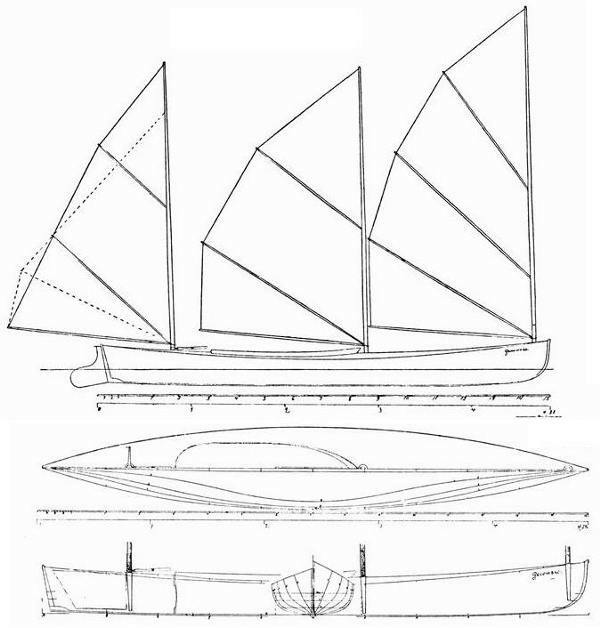 In 1908 Hope designed Haze, which had a more modern type of shape with a flattened stern. This too was a planing boat and on a reach she could lift her bow clear of the water back to the mast. There was more international competion in 1907 and 1908 when the UK, Austria, Italy, France, Belgium, Germany and U.S.A competed for international trophies offered by the Royal Canoe Club. Although normally 17' in overall length, English boats at this time had overhangs at each end, and the static waterline length was often closer to 15 feet. European boats were by now almost exclusively sloop rigged and the twin mast rig was more or less extinct. In contrast the US required their 16 * 30 racing canoes to have two masts and had a single boomed sail on each mast. In the pre war era they seem to have been using very high peaked gunter rigs with effectively a straight luff, but some photos appear to show bermudan (or marconi) spars. The Past and Future of American Canoeing 1880-1900 - W.P. Stephens. IC Life History web pages - Tim Gittins.